We are proud to be able to inform you that we have won 3rd place in the prestigious Grenander Award this year! Our image of offering our guests the best possible service and top quality, as well as creativity, innovation and qualified staff members has been given a distinction, with which we are highly pleased. 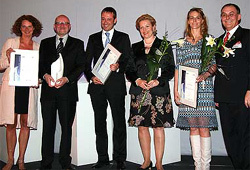 The distinguished jury was comprised of an independent committee of experts from the Arbeitsgemeinschaft City e.V., the Industrie- und Handelskammer zu Berlin, the Hotel- und Gaststättenverbandes Berlin e.V., and the Handelsverbandes Berlin-Brandenburg e.V., together with other accompanying experts, who thoroughly tested (incognito) our philosophy of putting quality first. The Grenander Award awards prizes to businesses which have distinguished themselves in the market through their particular focus on outstanding service. Emphasis is placed not only on expanding service demands, but also on increasing international guests and customers in the Spree-metropolis. 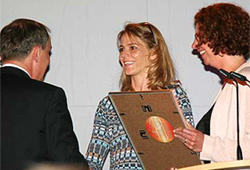 The award received its name from the architect Professor Alfred Grenander. Starting near the beginning of the 20th century, he shaped the image of the “City West” with his work, thereby also influencing the living habits and perspectives of its inhabitants. The underground station which he designed at Wittenberg Platz remains today a symbol of urban encounters in the western part of the city and a beautiful piece of his work. We hope that our hard work will be contagious for you as well and that we can offer you a home away from home where you can feel comfortable and “catch the spirit” of the hotel. Finally, we would like to say that because exceedingly high benchmarks of quality are a prerequisite for the Grenander Award, such a distinguished business is the perfect service provider for its clients! We look forward to welcoming you as guests in our hotel.